Soccer involves a lot or running and sprinting during the practice and during games. It's a very Yang-like activity, and soccer players are getting strength and training on a regular basis, especially in the leg muscles. Yoga practice can focus on preventing injuries, creating flexibility and to being the Yin side of life by offering space and a place of calm. The focus of a yoga practice for soccer players is mainly to improve the flexibility in the legs, hips and joints—especially the hips and the hamstrings where people tend to experience tightness. The Downward Facing Dog pose stretches the hamstrings and calves, as well as the shoulders. It also calms the nervous system. To start, come to your hands and knees. Place your hands firmly to the ground, tuck your toes under and rise to Downward Facing Dog. Start with your knees bent, back straight and long, tailbone towards the ceiling. Slowly straighten and stretch one leg at a time back bringing the heel closer towards the ground. 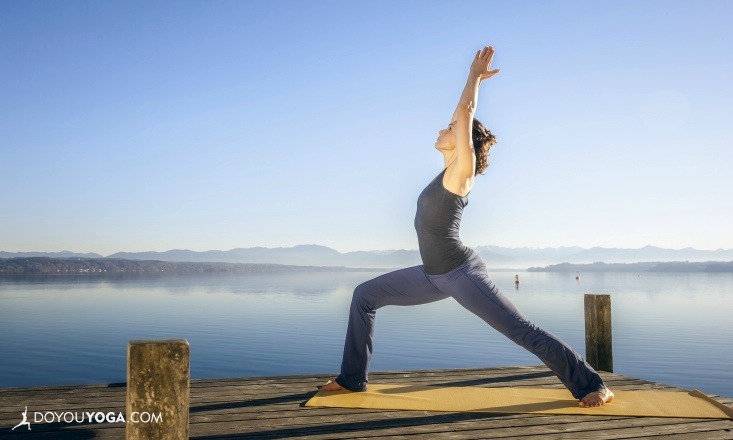 Warrior 1 pose opens and stretches the groin and stomach while strengthening the legs. To do this, start from Tadasana and step your left foot back and turn it slightly outward. Bring your arms up with an inhale, and with the exhale bend the right foot, making sure the knee stays above your right ankle. Keep your palms together if this is comfortable for your shoulders, otherwise keep arms shoulder distance apart, palms facing each other. Hold for 5 breaths. Half splits pose is great for opening the hamstrings and easing the tightness that running on a soccer field can cause. To do this, start by coming to your hands and knees, and step one leg between your hands to come into a low lunge. Raise your back hip above the knee while straightening the front leg, bringing the heel to touch the ground, toes pointing up. Place a pillow under your back knee if you need a more softer surface. Try to keep length in your spine, and reach your chest forward towards the front leg. You can have your hands on the ground, or on blocks to give you more space. Stay for 5-10 long, steady breaths. The Pigeon pose is a deep hip opening pose, stretching the hip rotators as well as the quadriceps and hip flexors. As a bonus, it also relieves tension and stress. Start coming to your hands and knees, and slide your right knee between your hands. If the knee feels stressed, bring the right ankle closer to the hip. Centre yourself so that your weight is even. You can stay upright, placing your fingertips on the ground and lengthening your torso. Or move down towards a sleeping Pigeon pose by either supporting the upper body with your elbows, or lowering yourself completely to the floor. Place a blanket or a block under your right hip if you need support to keep the hips even. Stay for 6-8 long, steady breaths. This is a great pose for creating space in the groin and inside the legs while strengthening your spine. To do this, start by sitting in Dandasana and taking your legs out wide. If you find that your lower back is curving, place a block under your hips. You'll want to create space and length between the pubic bone and your navel. Take your hands behind your back, your fingers facing forward, and lift the sternum. Sitting up straight might already give you a good stretch in the groin, so you can stay upright. If not, hinge from the hips and slowly walk your hands forward. As soon as you find yourself bending from the waist, stop going further and keep your spine straight. Stay in this pose anywhere between 1-3 minutes. Yoga can improve concentration and create a state of relaxed mind where the player is open and clear in the present moment. Moving in sync with the breath, and using the breath as a tool to relax and calm the body is a beautiful benefit a yoga practice can provide to soccer players, on and off the field.